Hi all! Have you recycled your holiday cards yet this year? We just gathered up our photo-less cards and addressed them for St. Jude’s. Here’s last year’s post with more information. Note: St. Jude’s takes every kind of greeting card, not just those from Christmas! If you have birthday cards, thank you cards, Mother’s Day cards – whatever! – that you’ve received and don’t feel quite right about throwing out, here’s a great way to have them reused. If you’d like to keep the sentiments inside, just send along the front half of the card. That’s the part they use, anyway. I take great effort to create our own holiday card. I make it a little different each year, spending hours fiddling in Photoshop Elements, shopping bargains on the photo printing sites, and hand-addressing each card. However, I have a dirty little secret. Every January, every card we’ve received goes into the recycling bin. I tried to save them for a few years. I really did. But it got to be a huge space-taker, and one day shortly after realizing we had too much stuff for our space, I threw them all out. Every January, I feel a twinge, but they still go into the bin, because honestly? I’m going to get new ones next year (yay! ), and we really do have more stuff than space. This year, however, I’m making a change. The cards without photos are going here. For the price of a couple of stamps, I am recycling these gorgeous cards in a very eco-friendly way and at the same time contributing to the care of some very deserving kids. One of those things constantly on our To Do List is organization, creating a place for everything, so everything can be in its place. Yes, I worked at a storage and organization store for several years. I can organize other people’s spaces like mad – I am an expert, after all. 😉 I just never seemed to apply it to my own home. Is that like the cobbler’s kids with no shoes or the handyman whose house is never completed? No, it’s probably just my usual…I’m so overwhelmed with the whole idea of doing it all, I choose to ignore it. But over the past two days, we made headway! Several years ago, we began recycling everything we could through our local recycling bank. Our contribution to the landfill has decreased dramatically, but we’ve been drowning in a sea of recyclables ever since. 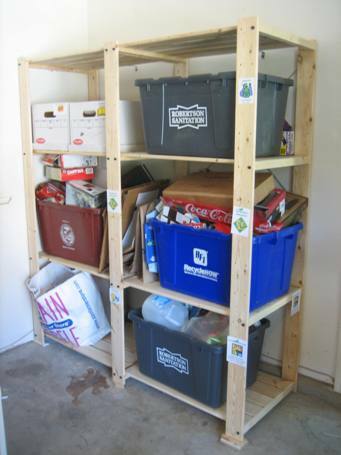 I’ve been “meaning to” get a shelving system up solely for the recycling for about four years now. We finally hit Ikea for these shelves a couple of weeks ago and got them built (and the space in the garage cleared for them) last night. I filled them today, complete with nifty little clip-art-enhanced signs. *Aimee’s storage tip of the day: Avoid using cardboard boxes that are held together with glue or tape as storage boxes. These adhesives are a favorite food of spiders, and they will be drawn to these boxes and nest in them. Totally true, I promise. Gross!! If you want to use cardboard boxes, get the file boxes that fold together, like the ones in my photo. Those old diaper boxes, paper ream boxes, etc…? Recycle them. Trust me on this one.